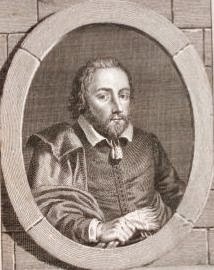 Philip Massinger (1583–1640). A New Way to Pay Old Debts. A cunning uncle cheats his worthless nephew out of his fortune. The nephew, laughing stock of his former servants, sets out to retrieve his old position and riches. And privilege in the wine-cellar. FURN. Let him; I’ll be angry. Cooks, by their places, may be choleric. ORD. Nay, nay, no wrangling. FURN. Twit me with the authority of the kitchen! AMB. There was no hurt meant. FURN. I am friends with thee; and yet I will be angry. I am angry with my lady. ORD. What cause has she given thee? FURN. Cause enough, master steward. And, till she forswore eating, I perform’d it. AMB. But you had wanted matter there to work on. I had kept the town till doomsday, perhaps longer. ORD. But what’s this to your pet against my lady? Or water-gruel, my sweat never thought on. ORD. But your art is seen in the dining-room. Who eats not well, can ne’er do justice well. Or strumpet’s ravenous appetites. Knocking. ORD. Our late young master! If you have a stomach, a cold bake-meat’s ready. ORD. His father’s picture in little. FURN. We are all your servants. AMB. In you he lives. This is yet some comfort. Is my lady stirring? ORD. Her presence answers for us. L. ALL. Sort those silks well. I’ll take the air alone. Exeunt Waiting Woman and Chambermaid. But will you never taste but spoon-meat more? To what use serve I? To buy thee aprons, and a summer suit. L. ALL. Do, and leave them. Nay, stay you, Allworth. Exeunt ORDER, AMBLE, FURNACE, and WATCHALL. To wait on your commands. L. ALL. So soon turn’d courtier! No scruple lessen’d in the full weight of honour. But he will in person first present his service. The path my lord marks to me. With such respect as if he liv’d in me. Your bounties shower’d upon me. L. ALL. I much hope it. Which but to doubt were impious. And hath to vicious courses sold himself. ALL. I shall obey in all things. As I hear from you. ALL. I am still your creature. Exeunt. Note 1. A room in Lady Allworth’s house. Note 2. The siege of Breda by Spinola in 1624–5 was one of the great events of the time. Note 4. Bread soaked in hot water and milk. Note 5. Q. reads Cooke. GREEDY. Not to be seen! GREEDY. Is it of the right race? AMB. How his mouth runs o’er? FURN. I’ll make it run, and run. Save your good worship! GREEDY. Honest Master Cook, thy hand; again, how I love thee! Are the good dishes still in being? Speak, boy. GREEDY. That I might now give thanks for’t! The fattest stag I ever cook’d. A ponderous chine of beef! a pheasant larded! And red deer too, Sir Giles, and bak’d in puff-paste! All business set aside, let us give thanks here. FURN. How the lean skeletons rapt! OVER. You know we cannot. And if you fail to come, you lose the cause. Will you lose me a thousand pounds for a dinner? When we think of profit. Send you—a brace of three-pences. FURN. Will you be so prodigal? OVER. Remember me to your lady. Who have we here? Thou art no blood of mine. Avaunt, thou beggar! I’ll have thee cag’d and whipp’d. GREEDY. I’ll grant the warrant. Think of pie-corner, Furnace! [Exeunt OVERREACH, GREEDY, and MARRALL. WATCH. Will you out, sir? I wonder how you durst creep in. But you must needs press into the hall? My scullion shall come to thee. Oh, here’s Tom Allworth. Tom! Nor would I have you seen here for a million. Exit. WELL. Better and better. He contemns me too! WOMAN. Foh, what a smell’s here! What thing’s this? WOMAN. I begin to feel faint already. [Exeunt Waiting Woman andChambermaid. By the head and shoulders? WOMAN. Sweet madam, keep your glove to your nose. And then I shall forget these. Can fall so low as to change words with thee? Nor these rags, with my poverty, in me vices. For your late noble husband. L. ALL. Have you aught else to say? A boast in me, though I say, I reliev’d him. L. ALL. ’Tis most true, he had. But be suppli’d elsewhere, or want thus ever. To strangers; and ’tis this. Whispers to her. L. ALL. Fie! nothing else? To throw away a little respect upon me. L. ALL. What you demand is yours. WELL. I thank you, lady. Shake hands, and end all quarrels in the cellar. FURN. Still merry Master Wellborn. Exeunt. Note 1. A hall in the same. Note 2. Part of the back: ribs or sirloin. Note 3. The basket of broken meats given in alms. Note 5. A leathern beer can.